Check out our MABR white paper for a detailed overview of this revolutionary wastewater treatment technology. 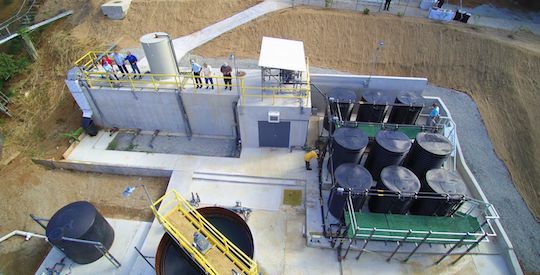 Activated sludge treatment has long been used for aerobic wastewater treatment, but its aeration stage is particularly energy-intensive, which makes it cost-inefficient. Fluence’s self-respiring membrane aerated biofilm reactors (MABRs) provide an energy-efficient alternative. MABR technology is based on passive aeration, that is, the diffusion of oxygen through membranes. MABR’s energy efficiency makes decentralized treatment more feasible. Are you looking for an energy-efficient wastewater treatment solution? MABR could be just what your operation needs. These small- to medium-capacity systems save up to 90% on energy use for aeration, compared to conventional plants. This efficiency means MABR modules can be powered by solar arrays, bringing treatment to where it hasn’t been possible before. Contact our experts to discuss your specific project details and learn how MABR can help you meet your goals. Contact us to learn more about our MABR wastewater treatment solutions, or to discuss your next project with our experts. Fluence’s MABR modules use low-pressure passive aeration, which reduces the energy used for aeration by up to 90%. This low energy consumption allows for decentralized treatment off the power grid. MABR’s efficient nutrient removal produces high-quality water suitable for use in irrigation for discharge into the environment. A biofilm that forms on the spirally wound membrane supports simultaneous nitrification-denitrification (SND) for high nutrient removal. MABR’s simple design means low maintenance and operation costs, and the systems can be remotely operated and controlled. Using passive aeration not only saves energy, but it also lowers levels of noise and odor for neighborhood-friendly operation. Fluence MABR solutions are available as an upgrade to existing large-scale plants and also as decentralized, scalable, easily portable systems packaged in standard shipping containers. 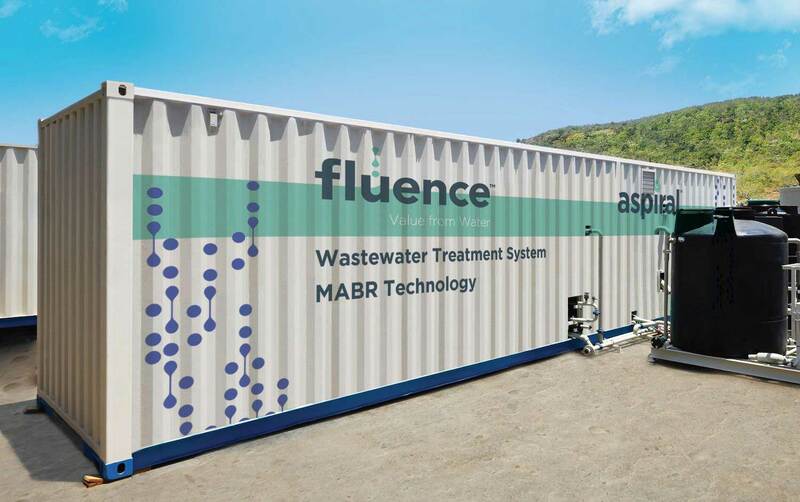 For maximum flexibility, Fluence offers its MABR technology in two versatile formats: our Aspiral™ line is available in a variety of capacities, and our SUBRE line is used to retrofit existing aerobic WWTPs, cutting energy costs, increasing capacity, and improving effluent quality. Aspiral is a smart wastewater treatment solution that packages our innovative MABR technology in standard shipping containers. This modular solution reduces energy usage for aeration by up to 90% compared to conventional methods. Aspiral is an ideal solution for small- to medium-sized plants serving small towns, villages, residential communities, resorts, hotels, commercial complexes, and more. Aspiral’s efficiency makes it ideal for decentralized treatment off the grid since its low energy needs can be supplied by alternative sources. The Aspiral Family offers several model sizes and configurations, with treatment capacities starting at 20 m3/d, depending on effluent requirements and design temperature. Several containers may be connected in parallel to handle large quantities of effluent. For operating ease, the systems can be remotely monitored and controlled. All process units — for example, the mechanical screen and secondary clarifier — are customized for each installation, and the plumbing between the main process units is installed onsite. Pretreatment mainly includes fine (1 mm) screening, which is followed by oil and grit removal. MABR treatment removes 80-90% of biological phosphorous, and chemicals are used only when additional removal is required. Tertiary treatment such as filtration and disinfection are compatible with the process and can be provided separately. Our Aspiral containerized wastewater treatment solutions come in several configurations to treat from 20 to 350 m3/d (13,000-90,000 GPD) of municipal wastewater. Aspiral wastewater treatment plants feature energy-slashing MABR technology that’s neighborhood friendly with low noise and odor levels, making them ideal for decentralized treatment. They’re packaged in standard shipping containers, and offer fast installation and startup. Is Aspiral right for your wastewater treatment needs? Contact our experts to learn more about MABR and to discuss your next project. Aspiral MABR units can be used in tandem to customize plant capacity. 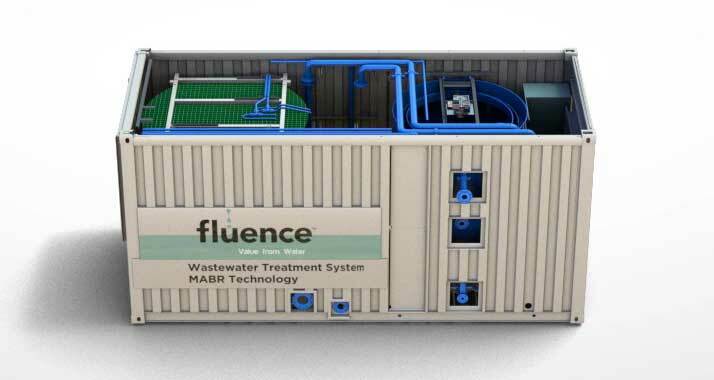 When a conventional activated sludge wastewater treatment facility has reached its limit, Fluence’s SUBRE can come to the rescue. Instead of enlarging current plants and building new basins, SUBRE modules are submerged in existing chambers, improving effluent quality, lowering the use of chemicals, saving energy and operational costs, and enlarging capacity. 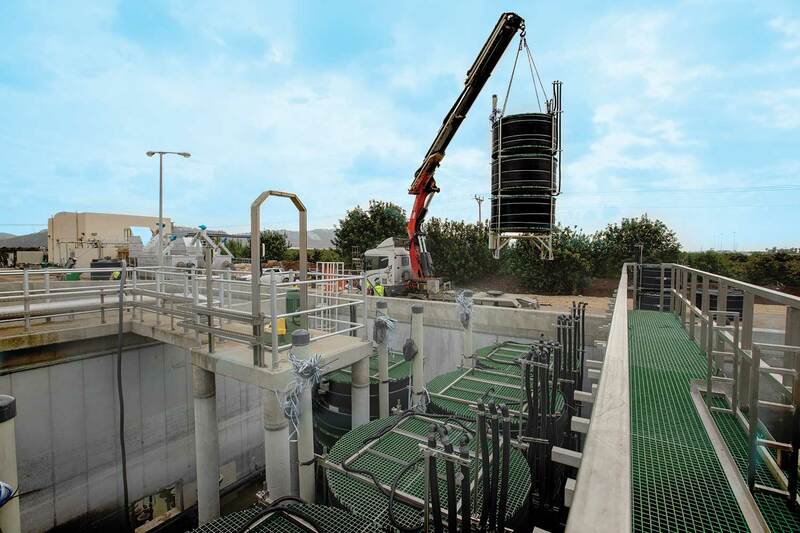 SUBRE upgrades WWTPs using membrane aerated biofilm reactor (MABR) modules. SUBRE is designed to upgrade existing basins with capacities of 2,000-100,000 m3/d (0.5-25 MGD) or improve effluent qualities to meet stringent nutrient regulations. In a SUBRE upgrade, The SUBRE modules containing up to 4 levels of MABR spirals are submerged in the anoxic zone of the WWTP (in a fully aerated reactor with no anoxic zone, construction of a separating wall will be required). Easy-to-install MABR modules are energy-efficient and cost-effective, and ensure high effluent quality due to simultaneous nutrients revmoal. The SUBRE modules are suitable for installation in basin depths ranging from 1.5 m to 6 m (5-20 feet). The modules are anchored to the basin floor and are aerated by a separate low-pressure low-flow blower. Coarse bubble diffusers are used for periodic mixing of the suspended biomass (utilizing existing aeration blowers if possible). The retrofit can be performed with minimal interruption, one basin at a time. Results seen in one to three weeks include an improved effluent quality and up to a 30% decrease in the plant’s overall energy use. And, SUBRE will greatly save on operational expenses. Decrease operational costs by up to 30%. Are you looking for ways to get more from your existing wastewater treatment plant? Contact our experts at Fluence for more information on how you can increase capacity, cut energy use, and improve effluent quality with SUBRE MABR modules. 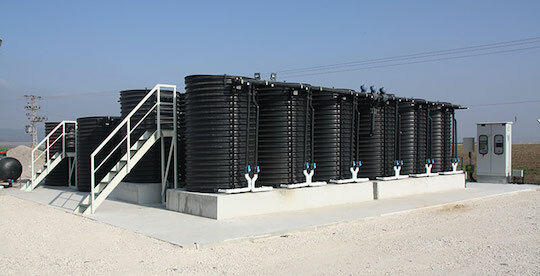 To increase capacity and effluent quality, arrays of SUBRE modules can be submerged in the basins of existing WWTPs. The Bordeaux area of St. Thomas needed a wastewater treatment plant to replace an old one that didn’t meet environmental regulations or industry standards. An MABR plant was designed, delivered, and commissioned providing high-quality effluent within seven months. It economically provides wastewater treatment for 200 homes, and can be easily expanded if required. The plant’s quiet, odorless performance was important on the island, which relies on tourism. When a residential development in Israel wanted a localized wastewater treatment solution to replace its existing pond system, it needed an odorless, quiet solution that would be energy-efficient, handle a high-nutrient stream, and use existing pond structures. The plant uses our revolutionary membrane anaerobic biofilm reactor (MABR) technology to treat 123,000 L/d, producing high-quality, reclaimed water suitable for agricultural reuse.